At 45 years old, in 2010, when our third child was preparing for college and my daughters were in the midst of their college educations, I had time to reflect once again about the direction my life was heading. I had spent the last seven years focusing on three very important people: my children. They were, in my opinion, now three young adults who needed me less. It was time to stop hovering and start letting them fly. It was no newsflash how lucky I was to have the freedom to consider where my life was going. I was in good health, had wonderful friends and an incredible thirst for learning and growing. I was blessed with a husband who encouraged my free spirit, tree hugging, dreamer thinking. I was a massage therapist by trade, a mother, wife and nurturer in many other realms too. Now that my son was also on his way, my time as a daily hands-on mom was fading and I knew that I had the opportunity to not only dream, but to commit to a dream and make it a reality. I knew also that the nurturer in me would always be seeking new opportunities and this time in my life, although uncertain, would welcome new gifts and new adventures. One winter afternoon, I was canvassing the paper or internet (can’t remember) and learned about B.I.G. (Believe, Inspire, Grow). From its website: B.I.G. is a gateway for women entrepreneurs. We offer support, education and relationship building opportunities for our organization comprised of amazing and diverse women. We aim to provide relevant business information, peer support and motivation to educated women who desire personal and professional fulfillment. When women empower women, magic happens. As the story goes, I drove one hour north, in a February winter storm, to attend my very first B.I.G. meeting in Bernandsville, NJ. Each year since, the storm gets stronger and I recall myself walking against the wind to seek shelter inside the church. I arrived to a beautiful open church and the snow was falling down around us, visible through the many cathedral windows. The women there were excited entrepreneurs. I stood and declared my idea. I was hugged. I was cheered. I was home. It was there I decided, after one month of refection, that I would start Hope Loves Company, the only non profit in the U.S. with the mission of supporting the children and grandchildren of PALS (people living with ALS). I had chosen the name in 2007 and one year later or so, my sister-in law, Keiren, created the perfect beautiful logo which captures our mission. While raising three children who had lost parents to ALS, the name Hope Loves Company came to me. Our children had all lost a parent. Our children had struggled with that loss as we had. More children needed support too. It was the beginning of what is now a fully-functioning and rapidly growing non profit. I was congratulated and uplifted in my declaration there among the women and the falling snow. At that time, there were only B.I.G. meetings taking place in North Jersey, so I immediately reached out and contacted its founder, Tara Gilvar and offered to run a meeting in Central Jersey which I continued to run until just last month. During one of our recent B.I.G. teleconferences, it was suggested, as a feel-good act and new year practice, to reach out to five members with a good old-fashioned phone call or letter. I love me some good old-fashioned and chose the letter option of the recommendation. I sat and pondered. Who do I admire? Who has inspired me to be a better person? Who is always positive, uplifting and supportive? I chose five thank you notes and purchased five small trinkets. I inscribed the cards with gratitude to my mentoring recipient. I sat smiling as I wrote and thought of each person, her gifts and her reaction when the card was opened. They would be receiving real mail. They would enjoy opening my card. This might be a ray of sunshine on a cold winter day. With each note, I received a phone call. On the other end of the line was an elated voice, filled with surprise and joy. Each phone call was sincere and meaningful and each made me smile. The 5 notes were a hit and the gift continued to give to me as well. When I was little, around twelve or so, I did something very unusual for my age. At Christmas and on New Year’s Eve, I would pick up the big yellow phone book, open it, close my eyes, point somewhere, and call the number before me. I would then say either, Merry Christmas or Happy New Year to whomever answered the phone. “Well thank you!” a cheery voice would say. We’d have a conversation and finally, soon into it, I’d get asked, “Who is this?” My answer was always the same: “A stranger who wants to spread holiday cheer.” It was a silly kid thing but it brought me great joy. I remember speaking to a few people who lived alone and simply enjoyed talking to someone, to me, a twelve year-old (strange) kid on a holiday that might have otherwise occurred without “company” . It took me a long time to narrow down five people to send notes to. This has me thinking. Why do I need to stop here? Why not extend the practice and the hopes of my twelve year old self to bring cheer? Why not send five more notes in February on Valentine’s Day? There are few things I need in this life. I know I need love and thrive on it. I need my family and my friends, my health and my work. I need my faith and my prayers. The selfish part of me needs to add something to that list, the need to make a difference. For this reason I can’t wait to write, send and share five more notes of love and appreciation in February and hopefully, inspire others to celebrate my Fifty Gifts, #12 by following my lead. She was seated beside me. I had held the door open for her when she walked in and she needed something that I had. The women all turned and looked at me. They wanted to know the answer to the same question: WHY do you have a unicycle? We upped the ante by running in between (once around the yard) five sets of 100 jumps. He soon bored of this “fun” way to pass the time with his crazy mom. The task to keep him entertained and out of young boy mischief (lighting matches, bee bee gun mishaps, accidentally strangling the dog by securing a Walkie Talkie around his neck) got trickier. So we bought him an 80 lb. heavy bag and boxing gloves and Adam and I began working out together. We got him weights, a flex machine, and a dear friend bought him a pull- up bar. All that stuff occupied a corner of our basement. Adam finalized the decor with a full size poster of Taylor Swift and various video games (which we limited). But as Adam grew, he, like most teens, outgrew his mom time. We were planning a family party and I thought, let’s get a unicycle. The unicycle was a big hit that day, but only one person in our family took real interest in riding it – Adam. He spent hours and hours practicing. Months later, he could successfully ride the unicycle up and down our driveway without falling. It was so wonderful to witness him master that skill and the smile on his face was priceless! It was a unicycle for one -amazing son. Do you live in or around Trenton? You can join Trenton Circus Squad. There is no charge. And it doesn’t matter whether you already have circus skills or not. You will learn incredible feats, make new friends, and work with a team of others. You will perform for your community and teach skills to younger kids. Be warned: there will be a lot of fun and laughter involved! Author joamesPosted on December 22, 2015 December 24, 2015 Categories 50 Gifts, UncategorizedTags joy, kids, teens, turning 50Leave a comment on A Unicycle for One-More. Angels Exist Here on EARTH! I have always believed in angels; especially the heavenly ones. But angels come in all shapes and sizes, and can fly into our lives, right here on EARTH, just when we need them most. I have been blessed by many angels in my lifetime, but have to share one moment that occurred more than a decade ago; however that memory is still so powerful that it can’t happen without the inclusion of an enormous smile and a shiver. It was a few days after Labor Day, September, 2000. I awoke at six, as I did every morning- quietly rolled out of the twin bed in which I slept. My bed was adjacent to my husband’s bed, a hospital bed. The hum of his ventilator could have easily rocked me back to sleep but I had work to do. So, I shuffled out of my slippers and night clothes and into my day clothes and clogs. My husband Kevin was asleep and so was our daughter, Alina then age 8. Alina would need to go to school in a couple of hours and I would need to help Kevin out of bed, and ready him for a new day. But at this very moment, I had some quiet time to myself. I walked into our kitchen where Kevin’s nurse sat, drinking coffee. I gave her a hug and put on my light jacket. I drove two blocks to the nearest WaWa and got my regular fix, a hazelnut latte, bagel and newspaper. Then I sat in my car, radio humming softly and took sips of the hot, creamy caffeine. The bagel and paper remained untouched. It was too early to be hungry – it was too early to read what was happening in the world. Instead, I cherished the coffee and enjoyed my solitude. For those ten minutes, my life was normal. I was a mother, a wife and worker prepping for my day. My life, my work, however was anything but normal. That sacred space, where I could sit and sip and cry -was what I needed at the hour to prep for challenges the day would bring. Soon, I would be back at home, waking Alina and getting her breakfast. Then, I would gently wake my husband, who was, for the fourth year, bravely battling ALS or Lou Gehrig’s Disease. Kevin was now paralyzed, he was unable to speak and he relied on a feeding tube for nourishment and a ventilator to breathe. The physical Kevin, the one who went skiing, who played touch football, who mowed the lawn and hugged me tight- no longer existed. Yet, he was my love, my hero and my world and I would gratefully spend the day taking care of him in every possible way. I would help him to get out of bed. I would wash his face and his body. I would raise him with the help of a Hoyer lift and help him onto the toilet. I would brush his teeth and give him his morning feeding through a tube. Afterwards, his nurse would provide his medications and then I would start range of motion on his stiff joints. Before my coffee was gone, when there were no more tears streaming down my face, I gathered my strength and drove towards home. “Like a baby,” she whispered. So I headed upstairs to wake Alina. Alina was consistent. She hopped out of bed and smiled. She looked into her closet and canvassed her drawers. “This dress and these purple leotards,” said Alina proudly. She dressed herself. She didn’t want me to brush her hair and did her best at grooming. She had a big bowl of cereal and had all of her homework done like the good girl she was and we packed up her peanut butter sandwich and snack and headed to the bus stop. I encouraged cheerful talk on our walk, but inside my heart was aching. The calendar said September and that meant Fall, soon to follow- Winter and if getting out as a family was tough in September, it was nearly impossible in February. I may have been crying for many reasons on that walk, sheltered by my shades, but at that moment I was mourning our many losses as a family, and the enormous loss to come. “Mommy, answer my question!” yelled Alina. I gave Alina a hug, watched her board the bus and waved until she was out of sight. Alone again, my thoughts returned to just one loss – that summer was behind us and my family had never made it to the beach. While a day at the beach sounded blissful, it was too much to ask for Kevin. A day at the beach was like running a marathon- an extraordinary event. It would mean having help with us, having medical equipment, keeping the wheelchair and medical equipment free of water and sand, it would mean keeping Kevin cool and comfortable, and it would mean a tough day for everyone involved. I hated crying in public, but that didn’t stop the tears from flowing. I was happy to have been wearing my sunglasses as I passed and said hello to the other parents. When I got to our home, I saw my brother’s car. “Wow, it’s early, what’s he doing here?” I thought. I loved when my brother visited. He gave me big hugs, he offered support both physically and emotionally to both Kevin and me. He was a loving uncle to Alina and he was very generous with the little time he possessed. My brother met me at the door. “Don’t come in yet,” he said with a grin. “Everything’s fine, just give me a sec,” he suggested. The burning bush, the one that Kevin had proudly planted was beginning to turn. I stood admiring its bursting hues and wondered what was taking place inside the house. Moments later, my brother joined me out front. “Ok, just trust me, “he said. Then he covered my eyes with a scarf and took my hand. I would have then and still would trust him with my life, so holding his hand as I walked blindfolded into my home was easy. Once inside, he asked me to sit down. He then took off my shoes and socks. “Jamie, what are you doing?” I asked again. I felt the carpet under my toes. I heard the dishwasher running. I heard the humming of Kevin’s ventilator. I heard the door to our patio open and took a guided step. My foot did not land on a brick patio as expected, but rather, something cool and scratchy. I soon realized that my toes were sinking into sand. It was a beautiful morning and the sand felt cool and welcoming under my feet. Still blindfolded, Jamie then guided me to sit down on a towel. He sat behind me and held me in his arms. Seagulls screeched in front of me. Mists of water speckled my face. “Here you go,” said my brother, handing me a hot latte and biscotti. We sat there, not needing to say anything. He embraced me while I sipped my coffee and nibbled my biscotti. I was in awe. What a miracle of love! I had never made it to the beach that summer but my brother had brought the beach to me! It was the nicest thing that anyone had ever done for me. It was perfect. For fifteen minutes, until Kevin woke and needed care, I was at the beach. When Kevin woke, my brother gently removed my blindfold. Now I could see where I really was. The patio was covered in sand. A CD player sat on the brick wall, inside were sounds of the ocean. He had supported the hose on a bucket and the water was set to sporadically mist. With my eyes open, the beach was gone. But that memory, that sincere gesture of love and hope, kept me basking in happiness for a long time. I will always be grateful for the day my brother Jamie brought the beach to me a nd to this day, his “beach” was the greatest gift of hope I have ever received. May an angel, heavenly or EARTHLY, enter your life when you need one most! Jamie (see picture) is still always there for me when I need an angel! Author joamesPosted on March 13, 2013 June 22, 2015 Categories Self-help, SpiritualityTags als, angels, beach, blessings, brother, caregiving, hope, lou gehrig's disease, love, mental-health, miracle, support9 Comments on Angels Exist Here on EARTH! As My ALS Journey and Family Expands! ALS entered my life in 1995 when my young husband, Kevin O’Donnell, received his diagnosis. He was only 30 years old and it would be difficult to put into words how that day and diagnosis impacted us for six years, and me for nearly two decades now. I have written extensively about my years with Kevin, as they have shaped my entire life. For his love and companionship, I am truly inspired and grateful. Since that day of Kevin’s diagnosis in May of 1995, I have been on an ALS (Amyotrophic Lateral Sclerosis) journey. My journey started as I embraced Kevin while we received the devastating news which was incompressible; I heard every other word. Neurological. Terminal. Live. Percentage. Hope. When Kevin lost his battle with ALS in 2001, I lost a huge part of me. It took me YEARS to accept that he was gone and to understand that having him as my husband for only nine years was better than NEVER having him at all. He was brave, funny, loving and kind. I find myself now, after some of that pain has subsided, understanding that I would not have changed my role as wife, caregiver and advocate, even had I known what would ensue, for anything. It was the greatest role of my life and one for which I am proud. Today, I live each day in Kevin’s memory – charged with continuing his battle in the fight against ALS and in the hopes of helping new families currently faced with this horrific disease and the enormity of that challenge. Food for thought. I filed that information mentally. Since then, with the help of my HLC Board, we have reached out to ALS families all over the United States- offering them our love and support. We have sent free copies of the children’s book, What Did You Learn Today? to families in Connecticut, Pennsylvania, Texas, Washington, Alabama, Tennessee and more. 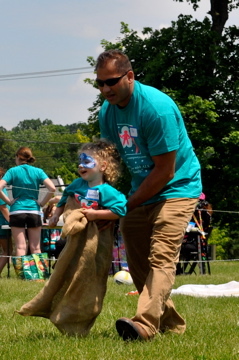 HLC had its first Kid’s Day in June 2012 for ALS children and their families. I was overjoyed to see the positive response from families, volunteers and Waterloo Gardens, all of whom generously embraced the day and HLC. Waterloo Gardens in Exton, PA even donated their grounds for Kid’s Day! Over the summer, HLC received its first large donation from Steve and Michel Gleason, of Team Gleason- a generous welcome and congrats that officially tagged us as a non-profit organization with big shoes to fill. Steve reminds me of Kevin, living bravely with ALS and making an impact every day from his wheelchair; accomplishing much more than most of us who are not challenged by a neurological disease. In October, I was reminded that the National Alliance meeting in Chicago was just around the corner. I called in my troops. My dedicated sister-in-law Keiren updated the website and brochure. My dear friend Linda helped with contacts and preparations. My friend Margaret picked out just the right clothes from my wardrobe. Riverton Health and Fitness Center and their monthly donations to HLC gave me hope for the camp that I was about to reveal to a very large audience. My incredible intern Emily created my presentation, one that took us a few visits to perfect. I lived for weeks, at my computer, in my pajamas, with one goal: share HLC with the ALS community and share it well! There were days when I began my work at 6 am and realized by 3 pm, that I had not had breakfast! On December 1st, in the midst of Christmas gifts and decoration, I parked my suitcase. My husband Warren loaded our car and drove me to the airport. Best of all, our three amazing children wished me luck and said I would do great. Wow. The ALS Hope Foundation generously sponsored my trip to the conference and gave me the opportunity to present HLC. Without my generous team, I would have been back in New Jersey still working, when my plane left for Chicago. Alone, with the spirit of my team in my heart, I headed to Chicago, slightly apprehensive yet passionate about sharing HLC with the world. Day 1- I sat in a room of 80 attendees- a menagerie of patients, caregivers, advocates, scientists, doctors, etc… and felt smaller than my already small stature. Will others rally behind my cause? Will my presentation go smoothly? Will this experience move me forward in my work as an ALS advocate, for ALS families in any way or in many ways? I had no sleep the night before, due to these concerns. As I looked around the conference room, I sat in awe. Diverse cultures. Diverse appearances. Diverse languages. Conversations were taking place in many languages foreign to me. How can we unite our efforts when we don’t share a common language? The first few speakers presented. Ten powerful minutes each. Stem cell hope from Israel. Raising funds suggestions from Australia. ALS forums and their place in the U.S. I sat stunned. Quiet. Attentive. I nodded in agreement with everything that was being said. Wanted to shout a huge, “Amen!” but avoided the temptation and the opportunity to embarrass myself. It quickly became clear to me that we did all share a common language at the International MND/ALS Alliance- ALS. We united in the face of ALS and our determination to help make a difference to patients and their families. Day 2 – It was my chance to present Hope Loves Company. My leg was wiggling back and forth. I began to shiver, yet, I stood and presented HLC and my journey to a room full of reflective strangers. When the HLC video ended , I could hear the shuffling of purses, in search of tissues. As I left the stage, I was greeted by smiles of approval. For most of my life as an ALS advocate, I have been alone. Kevin’s picture was the impetus for motivating my work. Then I met my husband Warren, his children Nora and Adam and placed a picture of their mother, Tina, next to Kevin’s. Over the last eleven years, I have added hundreds of pictures (in my heart) to that line of heroes gone too soon. But most of my work is done in isolation, just me and the computer and an email address of someone who needs more information, a place to vent, a reason for hope. Following my presentation, several people came up to me for bear hugs. One man who spoke no English kissed my hand again and again. I have never felt less alone in my ALS journey. The culmination of Day 2 of the conference ended with a Warm and Fuzzy dinner, as it was aptly named ten years ago. After a chocolate themed dessert, each of us had the chance to stand and say something. I couldn’t resist. There, I had learned that in Latvia, Russia people wait six years for wheelchairs. I had cried with a woman from Taiwan whose young husband lives with ALS. I had exchanged ideas with a woman from France who helps ALS families. My willing heart will bring me back to the National MND/ALS Alliance conference next year and I will feel right at home as my ALS journey and family expands. Author joamesPosted on January 3, 2013 January 3, 2013 Categories Uncategorized9 Comments on As My ALS Journey and Family Expands! My children (young adults at present) may see me as old -fashioned for many reasons. I believe in strong core values, the act of saying please and thank you and the relevance of sharing dinner and prayer together. But, I’d rather think of myself as an old soul. I’ve been comfortable with that persona since my early twenties, but now that I am 50, perhaps I’m just old! According to Urban Dictionary, an old soul is a “spiritual person whom is wise beyond their years: people of strong emotional stability”. Basically, someone who has more understanding of the world around them. While I want to believe that Urban Dictionary has me pegged, I am not everything described, but I do feel as though I am always observing and trying to make sense of the world around me. Usually, I am trying to make sense of why I don’t always fit in. During the holidays, having an old soul for a parent can be a drag. I’m hoping that you’re intrigued and are ready to take the old soul Christmas questionnaire, so if you read the characteristic below and find yourself nodding incessantly, you too are guilty my friend. And your children are probably calling you Scrooge. You decorate just enough to show you are celebrating the season, but not enough to be the recipient of oos and ahhhs. You use recycled paper from last year’s holiday and value your resourcefulness more than your ability to dazzle. You relish the taste of one amazing out of the oven snicker doodle- warm and melting in your mouth with delight. You only send cards to those you miss, and you WRITE in your card, not simply sign your name. You take mental notes year long and have gifts in mind by Halloween. You make your own cards. You know the real meaning of the season and let that guide your actions. Sorry my children, but your mother’s an old soul. If I had my druthers, I’d be Beth in Little Women and on Christmas Day, I’d feed a family in need and that would be ideal. “Christmas won’t be Christmas without any presents,” grumbled Jo. “It’s so dreadful to be poor,” sighed Meg. “Some girls have all the pretty things, while others have nothing,” sniffed Amy. “But we’ve got Mother and Father and each other,” said Beth from the corner. So my children, there’s always Valentine’s Day to look forward to! For years, I hated my hands for many reasons. They have always been small, like the rest of me. They are neither feminine nor beautiful. These days they are wrinkled and striped with veins, blue and bulging. A few of my fingers are arthritic, wide and misshapen. My fingers end with stubs for nails, nails which have rarely worn hues of red or pink. Some days, I wish for different hands, hands that are delicate and pretty- with nails that can be dipped in dusty rose, chartreuse or coral without looking odd. But my hands are powerful. As a child, I used them to wrestle the aggressive middle school boys who thought girls were weak. One grasp of my hands so strong left them speechless and me with the nickname, Meatballs. My family is Italian so I received the nickname from embarrassed boys who caved in my vice. I hated the nickname but loved the power it demanded. Boys lined up to arm wrestle me, determined to beat “Meatballs” this time around. That same strength gained me the girl’s arm hang record in the 8th grade. The challenge was the Presidential Fitness Award and the competitors among us loved the fitness it demanded. While the boys did pull-ups, the girls had to complete the dreaded arm hang. Once in a pull-up position, the clock started to tick. My face flushed, my arms shook but I concentrated on the task at hand. “Please don’t let go!” I thought, as my hands tired at one minute and 23 seconds when they could no longer resist the pull of gravity and glide of sweat. They had held all of me, my nickname, my muscles, the meatballs in my belly and my will, as long as they could. I still have that faded certificate in a dusty file somewhere. Once a teen, I welcomed puberty and the chance to grow. My friends talked about needing longer jeans and sneakers with wiggle room, about meeting their parents in height, then joyfully surpassing them. That never happened to me. My body remained as though it failed to graduate eighth grade. I hated my small body, my small hands and my small life. I wanted to look like everyone else- to feel normal. Being strong wasn’t comparable to being attractive. It wasn’t glamorous to beat a boy in arm wrestling, hell, it was intimidating! It was not the best approach to finding a date! The human heart is said to be similar in size of the fisted hand. But something happened that year and my heart grew bigger than my smallness. Bigger than my fisted hand. It guided my hands in living and loving. Of giving and letting go. It didn’t matter that I was small in stature, I became instead, big in heart. I started to volunteer in my community. My hands were busy helping small children make crafts. My hands were busy making meals for sick neighbors. My hands were busy holding on to wobbly grandparents as they entered our home. I took my love for helping others to heart and studied to be a teacher. My hands guided my pedagogical years too. Dusty hands held chalk to board. Germy hands passed gnawed pencils to unprepared students. Sore hands graded hours of essays every weekend. Kind hands patted shoulders of children needing encouragement. Soon after I became a teacher, I met my future husband Kevin. He was the son of the school’s reading specialist, now my mother -in -law Marge. He was funny, handsome and strong. Two years after dating, I became his wife. Then my nurturing hands orchestrated my maternal world. Diapering, feeding, caressing, they never seemed to tire in their loving care of our daughter Alina. But the true job of my hands would be one that I had never expected. One that I was born to fulfill yet never wished gained from experience. Kevin was thirty years old when he received the diagnosis of Amyotrophic Lateral Sclerosis, ALS or Lou Gehrig’s Disease. He was my world and his terminal illness meant that WE were dying. Lay in your bed. Now, you can’t speak. You can’t move. You are depended upon a ventilator for every breath. You can’t eat but are nourished through a feeding tube. Remain there for minutes. Does it feel like hours? Years? Kevin was in that state for years. His paralyzed life alternated from hospital bed to wheelchair. His body had failed him yet his mind was fully capable of witnessing his body’s demise. And my small hands could only do so much. They could hold; they could touch. They could wipe tears, but they could not cure ALS. I felt hopeless- so small that I had prayed to simply disappear. One day while snuggling with Kevin, I began massaging his scalp. His short hair felt ticklish under my fingertips. I noticed the lines my fingers made as his hair parted beneath my touch. I liked the texture, the flow. My hands moved freely, with ease and fluidity. They were on a healing mission. I noticed Kevin’s body, soften and sink deeper into the mattress. His eyes were open, then closed. Kevin’s body became my canvas. My small, agile self moved gingerly around my sweet husband. He smiled as much as his atrophied muscled allowed. My strong hands never tired. I then sat above him, working my fingertips along his neck, gripping his shoulder muscles and feeling them melt under my touch. The world of ALS melted too. Kevin was at peace. So was I. There was an internal melody encouraging my movements; my fingers moved with positive intention, soft and giving. For the first time since Kevin’s diagnosis, I did not think nor worry. I was lost in this cyclical gift of giving and receiving. I moved like a dancer, elegant and trained. The enormous love that I wanted desperately to share with Kevin poured through my fingertips. It was the beginning of a new expression of my love for him and then for others. Twenty years have passed and I am now a licensed massage therapist. The gift of massage still gives to me as it did that first intuitive moment with Kevin. I massage people who are feeling pain, grief, exhaustion, and anxiety. I start each session with thoughts of my journey and how I arrived to that place and that person and not a massage goes by without enormous love from my hands with heart. Jack, a sweet faced boy of three, with long, blond wisps that fell into his blue eyes, ran, then hopped into my arms in 2005. I was the mother of three teens then. My teens knew that I was hopelessly smitten with every baby and toddler who entered my life and ready to share the maternal gifts that they now refused, those of hugging and reading, of snuggling and giggling, of mending invisible boo boos. My daughter Nora brought Jack into our home and our lives. Her friend had watched Jack then got a new job and was no longer available. “Could we watch him?” Nora’s friend had asked. Everyone knows that I love children. Everyone knows that I love teaching. Everyone knows that I still collect children’s books as though I have gaggles of grandchildren. “Well, of course,” I had said. Our entire family, the five of us, sat on the porch anticipating Jack’s arrival. We were told that he didn’t talk. That he might get frustrated by our lack of communication. That he had Autism and was on a strict gluten-free diet. I embraced the chance to learn more about Autism. To reach a child who may be unreachable at times. To teach my children about the joys and challenges of being responsible for a tiny human being. I knew that this experience would be bigger than their previous sitting jobs. I knew that this experience would be life-changing. That God had once again brought someone to us, for us. At the time that we met Jack, Nora was 14, Alina, 13 and Adam 12. They were typical teens who thought they had all of the answers. There were times when they didn’t need me or want me anymore. But they needed me to help them still with many things. They needed me to help them with Jack. What if Jack gets frustrated? What if we don’t understand what Jack needs? I was very excited about welcoming a new child into our home- about welcoming new chances to learn and grow as a family. When Jack and his mom arrived, I felt immediately connected. They joined us on our front porch. To communicate, Jack only grunted and used sign language back then. We all watched in wonder. What is Autism? Why does is occur? How will we communicate with Jack? Will he talk one day? Will my maternal skills be effective enough for Jack’s world? Jack’s mom carried an armful of Jack’s belongings. Toys. Diapers. Clothes. Gluten- Free food. She was the ultimate mom with a heart full of gold, devoted fully to Jack’s well-being. She was a single mom who didn’t miss a beat when it came to covering everything Jack might need. As a mother, I knew what Jack’s mom was feeling. She hated to leave her baby. She was unsure if the night would go smoothly. She wanted to know everything that happened and all that she missed. She wanted to trust us fully and hoped she could. She barely left in time for her second job of the week. In order to make ends meet, she was waitressing on weekends in addition to her full time job. Her commitment and compassion as a mother spoke louder than her exhaustion. Only a few years older than she was, I was exhausted just watching her. My children are becoming independent, I had thought. My life will get easier. Will there be a time when Jack will become independent? I wasn’t sure how we would break the ice- how we would let Jack know that we welcomed him into our home. Then I thought of bubbles. There are no words needed for bubbles. Bubbles are a universal sign of joy which span across cultures and ages. I remember once when I was nannying and I played bubbles with a baby while sitting in a community park. A Chinese family joined us. They spoke no English but their laughs were no different than ours. They too tried to follow and pop the bubbles. It was a touching moment between two different, yet similar worlds. Jack and I sat on the porch for one hour, blowing bubbles. We blew them into the wind. We blew them into the bushes. We blew them and then returned them onto the wand and watched how long they remained before popping. Jack giggled wildly with each popping bubble. My teens, at first apprehensive, joined in the fun and forgot for the moment, that they were losing their childhoods and leaning towards adulthood. It was a chance to fall in love again with my teens. It was a chance to fall in love with Jack. When Jack entered our home that day, his little hand touched the walls around him, he walked and caressed the wall, the counter, the table. This ritual seemed to comfort him. I followed behind him and did the same thing. He smiled. When Jack came again, he had a talker- a small digital box with pictures of people, places and things. It had pictures of people displaying feelings too and when Jack wanted to communicate, he pressed the picture and a voice spoke, revealing the word. Within weeks, Jack was an integral part of our family. We each took turns spending time with him. We knew every aspect of his visit and the rituals that he found comforting. His blanket. His books. His talker. His trains. His cars. In honor of Jack, we have instated “Not to sure” into our family conversations. Jack says not too sure to be polite, when he really prefers not doing something. “Not too sure,” is my polite answer! They know that the mall is the last place I want to go. Six years have passed since we first met Jack and he is loved more than ever. Nora and Alina are now adults in college, but when they are home and if they are available, they watch Jack. My son Adam is now 6’1”. He is eighteen and not always verbal, a mumbler when it comes to communicating with his parents. But in Jack’s company, he’s loving and boyish. Setting up racetracks and video games. Offering piggy back rides and grappling in our back yard. And in those six years, Jack has grown leaps and bounds. He is tall and nearly half my weight. He reads and works an IPAD like a fifteen year old. He is a kind and loving young boy. He wanted to lay in my bed, with me and my children, all snuggled together. We each took turns reading to Jack and he laughed and hid under the covers. I smiled at the joy that he brings me. The joy he brings us. I wondered how long it will take him until he no longer wants to snuggle and read with me. Will he be different as a teen because of Autism? Then I rubbed his back and asked him about his day. When he finished the details of his day, he started getting cozy and in position. Head to the side, arms sprawled out and I knew he was fading. Then he whispered into the room, “I love you Jodi,” before falling asleep. Priceless. That children with Autism are special. That children with Autism are gifts from God and are perfect as He created them. That children with Autism should have the same rights as all children. That children with Autism can be great teachers if we pay attention. That all children, especially those with special needs, need compassionate advocates like Jack’s mom. joames Create a free website or blog at WordPress.com.